All UK networks are covered for the same cost unlike many of our competitors who charge different rates for different networks and deliver via foreign networks. This includes sending text messages to landlines too. Texts start as low as 2.2p depending on quantity, please contact us for more details. This includes sending text messages to landlines too. 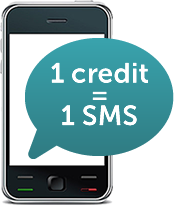 Texts start as low as 2.2p depending on quantity, please contact us for more details. NB - Prices based on prepayment, price is per message sent to any UK network including landlines, credits expire after 12 months. Prices exclusive of VAT. Our Inbound SMS services are subject to bespoke pricing - for further details please contact us.